Fayetteville, NC (May 2018) – Fayetteville Motor Speedway celebrating their 50th Anniversary in 2018, will host the World of Outlaws Craftsman Super Late Models on May 11-12th for the biggest Super Late Model event in the state of North Carolina. “The First in Flight 100, Presented by Hoker Trucking” in memory of Carlton Lamm will pay a whopping $25,001 to Win and $2,000 to start. In addition to this mega event there will be a Non-Qualifiers Race for drivers that don’t transfer into the main event that will pay $2,000 to win and $300 to start. As an added bonus for drivers and fans on Friday night May 11th the drivers that make it to the redraw out of each heat race will run a special “Big C Dash For Cash” paying $500 to Win that will determine the top starting positions for Saturdays 100-Lap $25,001 to Win Feature event presented by Hoker Trucking. Jim Long, promoter of Fayetteville Motor Speedway, has decided to make this mega event a Tribute to Carlton Lamm who recently passed away due to illness at age 77. Mr. Lamm is a former owner of Fayetteville Motor Speedway and long-time friend and sponsor of the Track with his Dunn-Benson Ford Dealership located in Dunn, NC just 30 minutes north of the Race Track. Dunn Benson Motorsports owned by Carlton and his son Kemp Lamm with their driver Bobby Pierce will also be entered in the event. The “Big C Dash for Cash” on Friday night will be in tribute and memory of Mr. Lamm. “We wanted to do something special this year to celebrate the 50th Year Anniversary of Fayetteville Motor Speedway. This historic event will be the largest payout ever at Fayetteville Motor Speedway and there is no better way to celebrate then to have the World of Outlaws Craftsman Super Late Models as the main event,” stated Jim Long Jr., promoter of Fayetteville Motor Speedway. “With the schedule of events over two days, race fans will get plenty of exciting racing action and see the top super late model drivers from all over the country compete right here in Fayetteville, NC. We also wanted to pay tribute to a great man, Mr. Carlton Lamm who has done so much for the sport of racing in this area and been a great friend to all of us here at Fayetteville Motor Speedway,” Long concluded. This year’s historic “First in Flight 100 -Presented by Hoker Trucking” will consist of two days of racing on Friday May 11th and Saturday May 12th. The World of Outlaws Craftsman Super Late Models will qualify and run heat races along with the “Big C Dash for Cash” on Friday Night. 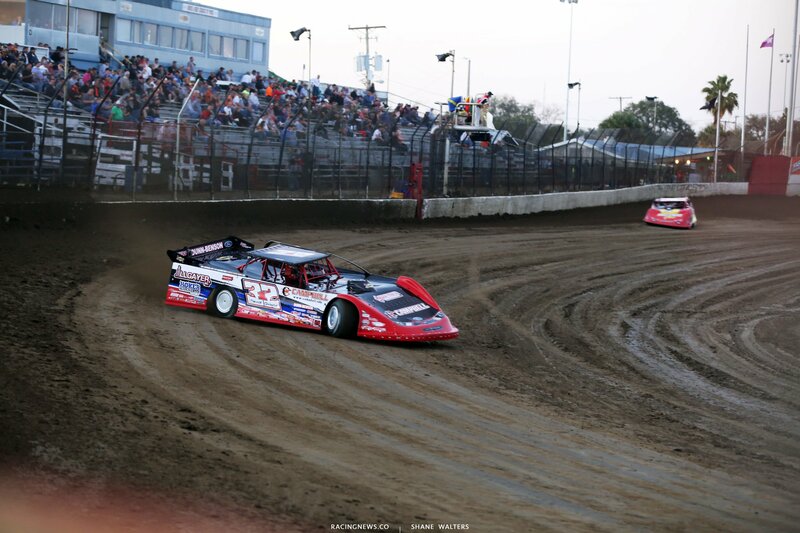 Then on Saturday night the World of Outlaws Craftsman Super Late Models that didn’t transfer into the main event through a Heat Race will compete in the B-Mains and the 20-Lap Non-Qualifiers race with the 100-Lap $25,001 to Win Feature event concluding the festivities. There will be support classes running both nights. Ticket Prices will be as follows: Grandstands General Admission Single Day -Friday- $25 and Saturday- $35. A Two-Day Pass for Grandstands General Admission will be on sale for $55. Pit Passes will be as follows: Single Day- Friday-$35 and Saturday- $45. A Two-Day Pit Pass will be on sale for $75. Advanced Reserve and VIP 2 Day Tickets are on sale now and can be purchased through the tracks website at www.fayettevillemotorspeedway.com. The purse for the “First in Flight 100” Feature event. Fayetteville Motor Speedway is located at 3035 Whitman Road in Fayetteville, North Carolina. For tickets, camping, hotels and information about the “First in Flight 100-Presented by Hoker Trucking” call 910-223-RACE (7223) or visit: www.fayettevillemotorspeedway.com. Also make sure to follow us on all social media outlets including Facebook and on Twitter @FayMotorSpeed. For information about the World of Outlaws Craftsman Super Late Models visit their website at www.woolms.com. FK Rod Ends, Black’s Tire & Auto Service, Jimmy John’s, Dunn Benson Ford, Dunn-Benson Motorsports, Mega Plumbing of the Carolina’s, Nichols Plumbing, Bobby Taylor Oil Company, VP Race Fuels, Hoosier Race Tire, Select Bank & Trust, Budweiser, Pepsi, R.A. Jeffery’s Distributing Company, 84 Lumber, Clayton Homes, Interstate Batteries, Sam’s Party Tents, HGR Truck & Trailer Sales, Scott Service Company, Fulcher Electric, WG Lot Clearing, Honeycutt Custom Cabinets, Powers Swain Chevrolet, Midsouth Wrecker Service, A-1 Portable Toilets, Tolar Supply Company, Harrell Builders, Lee Hyundai, Agri-Supply, Rock Auto.com.